Whether you want to cut, engrave, or mark, the Rayjet 300 is a high quality laser system, easy to use, precise, fast, and reliable. Ideal for professional engravers and first time laser buyers, regardless of the application. Easy to operate, Easy to finance, & Easy to maintain. Offers the best possible return on investment for any laser in its class. 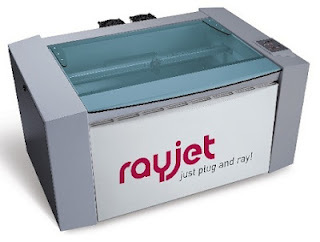 The Rayjet 300 has up to 80 watts of laser power, and a working area of 29" x 17"... Never before has 80 watts of power been this affordable! Over to you: How will the affordability, power, and reliability of the Rayjet 300 Change the game for you? Contact Us today for special pricing available to our first 100 buyers! This savings opportunity will save you up to $10,000 on your laser purchase! For pricing and payment options please fill out our "contact us form" or call our main office at 866-226-8505 and your local sales representative will provide you with a quote, payment options, and samples.